Dave Billings, the Kitefishing Club weighmaster, got one in before the winds went to the northwest and spent a day kitefishing at Kariotahi Beach. Dave managed to pull in 12 fish on one set. 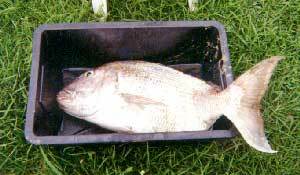 The five snapper ranged in size up to 2kg and the gurnard were all a healthy weight. Two small hammerhead sharks which came in with this set were quickly returned to the sea. There is an as yet unconfirmed report of a record landing of multiple 20lb plus snapper on a single Kite Longline set at the top end of 90 Mile Beach. If anyone has any details or photos I would be keen to hear about these fish. Dave Billings recently caught this fine haul of snapper and gurnard at Glinks Gully Dargaville. 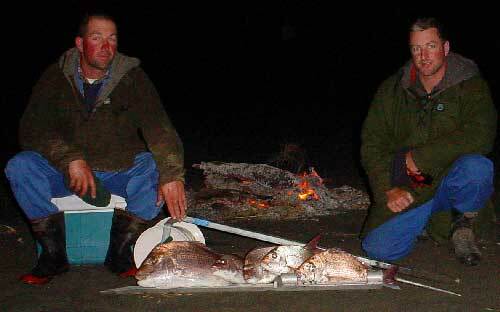 These are the good snapper we get off Waitarere Beach. We always target change of light at night and leave the kite out for 2 hours. Wayne Moham and Dave Stone show the results. The Northwesterlies over the last week have made kitefishing difficult on the more popular east and west coast beaches. Surprisingly, few fishers seem to be aware of the great kitefishing opportunities available in a northwesterly. I spent half an hour on the phone yesterday with a chap who has both a Flexiwing and a Pocket Sled Rig and he specialises in fishing very close to Auckland. In the recent northwesters he has been fishing on the northern side of the Waitemata Harbour with both rigs and catching ample snapper up to 5lbs on almost every outing. When the winds are from the northerly quarter most of his shots require a set of only 400 metres or less which is ideal for his Pocket Sled Rig. When the winds are more in the westerly quarter he fishes from the coast between Devonport and Whangaparaoa with his Flexiwing Rig. Ray O'Connor of Helensville dropped this photo into the shop earlier in the week. He caught the huge snapper about four weeks ago at Murawai Beach on a Kite Longline. Unfortunately Rob at the shop was too busy at the time to get all the details. The two white things at the top of the photo are the legs of an outdoor chair so it it looks as though the fish was well over the magic 20lbs mark. Another excellent kitefishing area for northerly quarter winds can be found at the southern side of Whangaparaoa, which is fishing red hot at the moment for school size snapper and some large kingfish. David Barnes reports that he has been fishing from a boat less than 500 metres from the shore off the last three bays on the southern side of the end of Whangaparaoa Peninsula and and has been catching limit bags of snapper in water as shallow as 2 metres. On David's last trip he watched his brother John get busted off after 20 minutes of intense action from what he believed to be a very large kingfish. Over the years Paul has done exceptionally well in northwesterlies fishing from Waiwera Beach using a Flexiwing Dropper Rig towing a reef ledger rig. The terrain here is difficult and only experienced ledger rig kitefishers should attempt it. For some reason the fish are much larger here than those caught at nearby Orewa and this may be due to the fact that the water is twice the depth for the same distance offshore. 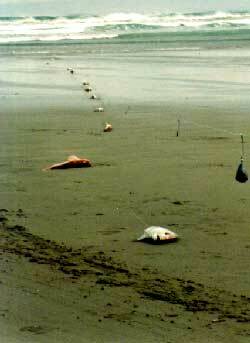 The northern tips of Uretiti Beach and Omaha Beach can also be kitefished successfully in a northwesterly wind. In fact, some of the best east coast catches around Auckland we have heard of have been taken from these spots in northwesters. On the west coast experienced kitefishers often kitefish from the northern heads of all of the Harbours with ledger rigs. We would suggest small rigs such as the Pocket Sled or Flexiwing for these areas. Further south there are huge kitefishing opportunities in a northwesterly. Several local kitefishers in the Hawera area consider a nor'wester the optimum wind to kitefish. Many of the bays on the eastern side of Coromandel Peninsula also fish very well in a northwesterly. Birdlings Flats in the South Island, just south of Christchurch, also produces well in northwesterlies which are often gale force. A local lad Deane and his neighbour who is also called Dean, have been making a habit of targeting snapper out off the East Coast Bays. They both went out for an hour during the week, in the middle of the day and managed two 5lb snapper and a couple of pan-sized snapper each. Again these fish were taken in less than 4 metres of water, so the fish appear to be in very close. The 5lb fish were both caught on Target Snapper Hooks so the neighbour is now convinced to try out Target Hooks himself. Out by Crusoe Rock there are a lot of school snapper, and good catches are being reported close to the Rangitoto Lighthouse. Sharks don't seem to be in plague proportions as they were a few weeks ago but there are still plenty of small eagle rays about. The snapper are fattening up for winter and they are now in prime condition. I caught some myself during the week and they had so much fat in them even the gut cavity is loaded with fat, you can even feel it on the fillets. This other good sign is the water temperature is on the decline and the smaller fish will soon be moving out and the average size will increase. As promised last week, here are the results of the trevally fishing trial my partner Mark and I have been conducting out on the Manukau Harbour. We have fished the Manukau for over 10 years in a clinker dinghy and target the abundant schools of medium to large trevally that are in the harbour during Spring and Summer. The majority of the time in the past I would come home with much less fish than Mark. About six months ago I decided to give the Target Snapper Hooks a go and see if that would make any difference to my catch rate. To be sure we could measure the difference we decided to allow Mark to use any rig or hook type and I would only use Target Snapper Hooks. On receiving my Target Hooks I noticed they were snelled on 20kg traces. One big difference I have learned over the years between fishing for snapper and trevally, is that trevally are very wary and shy of heavy line. As I regularly fish with 8kg line I re-snelled my 4/0 Target Snapper Hooks with lighter traces (8 to 10 kg). To say the worm has turned is an understatement. I now regularly arrive home with more fish, and bigger fish in the bag than any other person fishing on the boat. 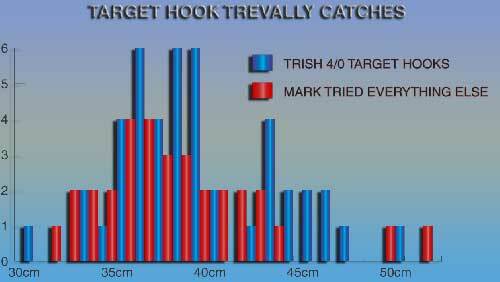 As you can see by the blue columns on the graph the Target Snapper Hooks are very good on trevally, both in numbers of fish caught and the average size of fish. While the number of fish in our sample is too small to draw any absolute conclusions from, the odds are now well and truly in my favour. As time goes by I will be updating the graph with new information. At the moment we aren't hooking into the trevally as much as we normally do, there are just too many snapper around! The trevally being slower to the bait than the snapper don't get much of a chance to get to my Target Hooks at present. Things should get really interesting next spring. That's when the really big trevally are hanging about. Such good fun in 2m of water and 8kg line. I can't wait. Stay online and keep an eye on the Trish's Trevally Hunt.